Netherlands: Generation Identity fascists claimed to have squatted a house next to the “We Are Here” refugee squats in Amsterdam. Squatted or not, the fascists had to leave after antifa activists attacked the fascists in their “squat”. Netherlands: Generation Identity fascists claimed to have squatted an apartment next to the “We Are Here” refugee squats in Amsterdam. Squatted or not, the fascists had to leave after antifa activists attacked the fascists in their “squat”. The Generation Identity claimed that they had squatted a house in the Rudolf Dieselstraat in Amsterdam, Netherlands. But the city council of Ymere in Amsterdam’s Watergraafsmeer district, denied that the house was squatted. The fascists were invited by somebody who has a temporary rent contract to avoid a squatting action. Todays action was a typical provocation of Generation Identity fascists. 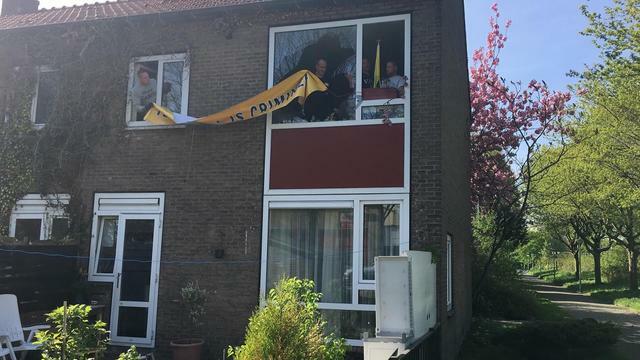 They dropped a banner “Illegal is criminal” and were waving with a Generation Identity flag, knowing that there are more than 20 “We Are Here” squatted apartments in the Rudolf Dieselstraat. Antifa activists reacted fast. On the video below (at 0:30) you can here the sound of breaking glass. The fascists had their windows smashed and were attacked with stones and fire crackers. After that the fascists had to leave the building for medical care. Although the fascists claimed that they would return after that, that might not happen. The temporary rent contract was terminated by the owner after their fascist provocation. According to a Tweet (below) of @AFA_Nederland well known fascists like Paul Peters, Willem van Dijk, Tom van der Hoek and Michael Jansen were inside the building until antifa activists forced them to leave.